Couture Landscapes is a Milton landscaping company seasoned in many aspects of landscaping, yard drainage and irrigation. 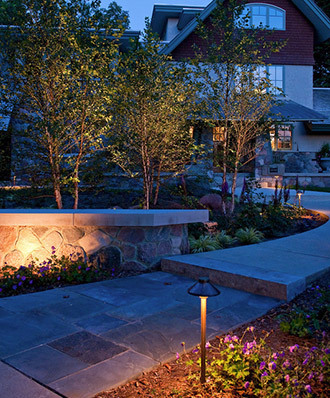 We can help transform any outdoor green space into a cozy and livable space. With the perfect design, style and placement of landscaping features; we can create a space that even your neighbors will love! For many years, we’ve worked with many clients with different needs and have always exceeded their expectations. It is not just the quality and timeliness of our work, but the exceptional level of customer service and personable approach we have with our customers. Before we implement, we work with you to understand your specific needs and design goals. In all aspects of landscaping, we own and operate both small and large sized equipment to affordably and quickly finish projects. For all landscaping in Milton, our team is always willing to put in the hard work to ensure you are satisfied with our work. We understand how important it is to have a living space that is not just aesthetically pleasing, but one that is functional and comfortable. Our years of combined experience in the business allow us to create masterpieces that we would also love to enjoy. Many people may be unaware, but the delicate detail attributed to the minor aspects of your landscape could have a considerable difference on the outlook. Our experts have worked on hundreds of projects and can safely and creatively provide a new and upscale look for your green space. Whether your landscaping needs requires an in-ground pool or a yard water fountain, we can find the right materials to make it happen. We work with the design concepts, pools and fountains our customers have selected and implement it into the overall landscape. A garden fountain is always a great addition to any home. As your local Milton landscaping experts, we offer superior quality service and design at an affordable price. Despite the rich and upscale look of the finished project, we can ensure you that it won’t break your budget. By understanding all your needs, from finances to design, we can confidently provide you with what you requested. Couture Landscapes is a Milton landscaper that can help you with all your landscaping, irrigation, drainage, walkway restoration and retaining wall needs. For a free estimate or to speak to one of our experts, give us a call today at 416-707-9492 or via email at admin@couturelandscapes.com.